Tree Surgery – All aspects of tree work conforming to B.S. 3998 (2010) and tree dismantling and felling. Hedge trimming – hedge trimming and general garden maintenance undertaken. 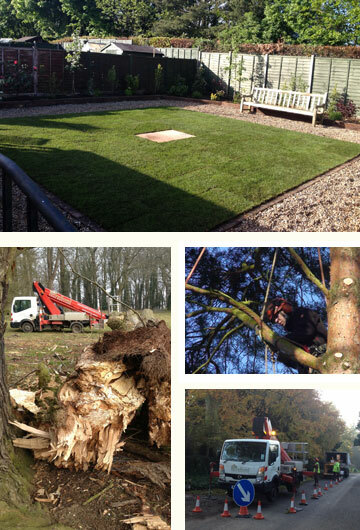 Grounds Maintenance – commercial and domestic; including grass cutting, strimming and hedge trimming. Stump Grinding – removing stumps to allow re-instatement of ground area. Landscaping – landscape design service through to management and execution of landscape projects – small and large scale projects undertaken. Consultancy – including Professional Tree Safety Inspections, Arboricultural Implication Assessments - B.S. 5837 Surveys carried out in respect of proposed developments for planning purposes, and general advice on tree health and management. Forestry – management of woodland and tree planting. Dealing with Local Authority Planning Departments in respect of Tree Applications for tree work in Conservation Areas and for trees covered by Tree Preservation Orders. Woodchippings for Sale – good quality 2.5 cm wood chips supplied by the cubic metre ideal for mulching in flower and shrub beds, mulching newly planted hedges and trees, fuel for woodchip burners and for ménage use. Anderson Access Solutions – the safe way to gain access at height. 27 metre vehicle mounted hydraulic platform for hire with a I.P.A.F. certificated operator.